I had bought some windows through menards while they were having an 11% rebate promo going on. 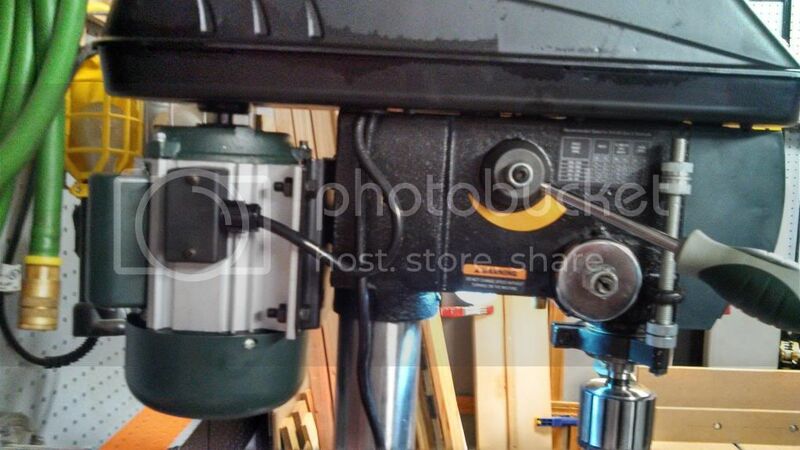 When the rebate arrived I decided I was going to buy a drill press with it. 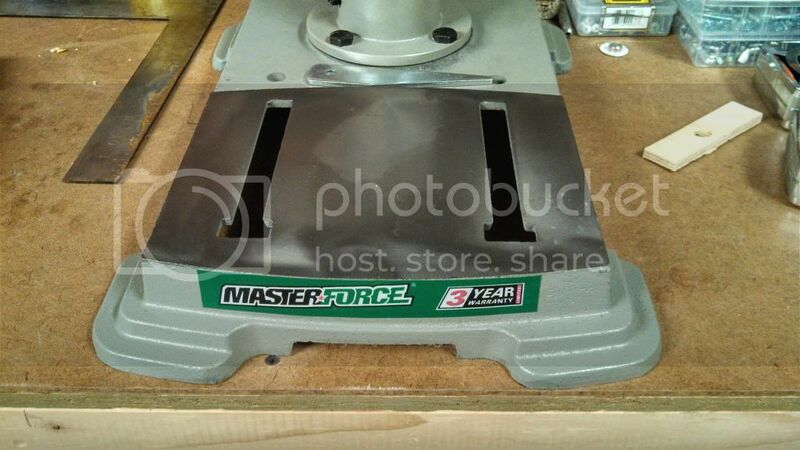 Out of all the drill presses that Menards carries this one seemed like the best one to me. The only other options were Performax and Tool Shop. So far it has done everything I need it to do. I especially like how you do not have to change belts to change the speed. The light is a nice feature and the laser helps get you close. Fit and finish is not amazing but that is not a big deal to me. Havent noticed any slop or Runout. Can you take a picture with the top open? I’d love to see how the variable speed works. 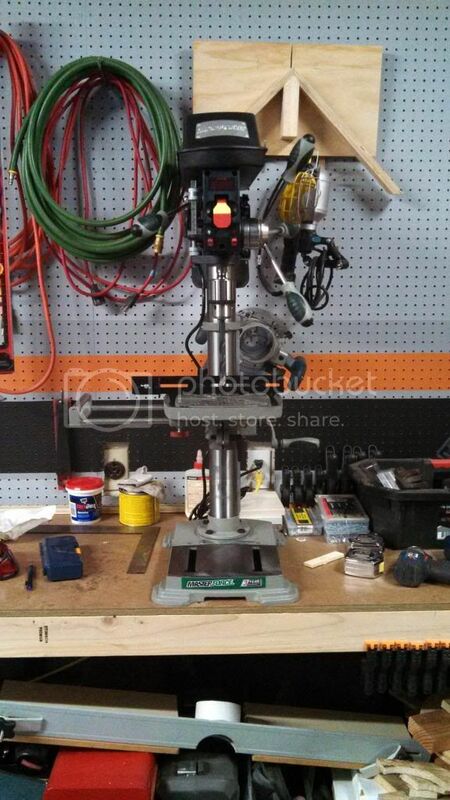 Looks like a nice drill press. All the features I would be looking for. 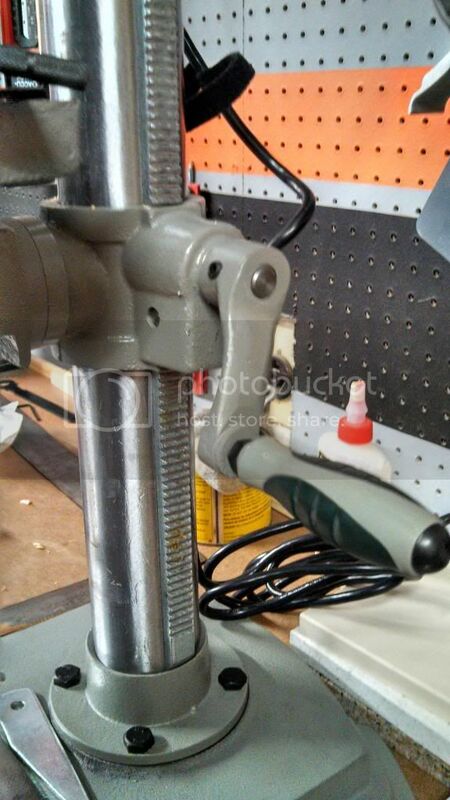 I’ve been keeping an eye on the Master Force drill press. Been wanting a drill press for a while. 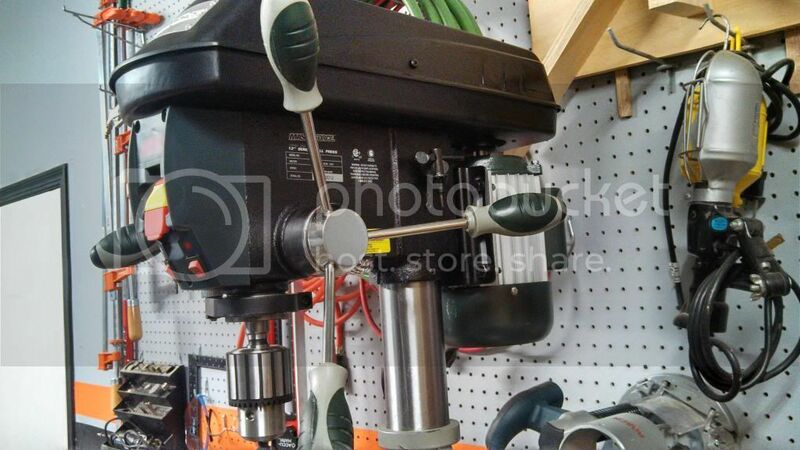 Menards also sells Rikon drill presses (and other various power tools), but it’s not very well known. They’re all special order. I guess the photos tell us everything but the price, chuck size , motor h.p., etc.. The photos make it look like a nice press. How long have you been using it ? @Maniac $229 I will see what I can do on the pic with the top open. 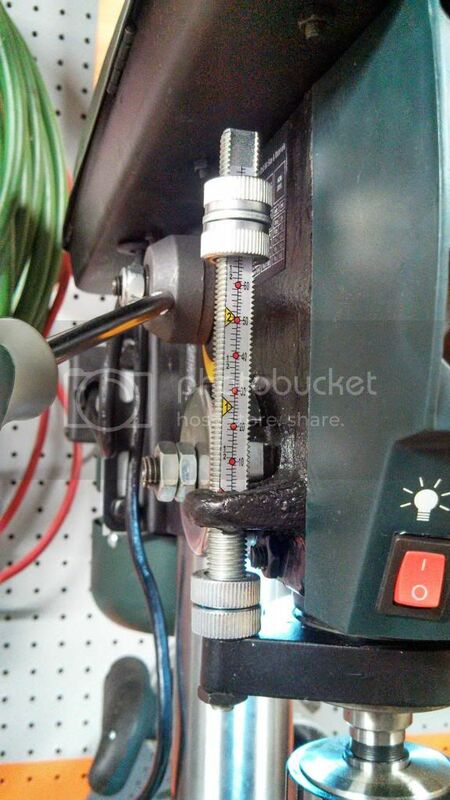 I have had this same drill press for nearly two years now … http://lumberjocks.com/reviews/2509 ... still going strong! I am a happy camper with this purchase. The horsepower is roughly .70 . Or just under 3/4 horsepower. Since Current (4.8 amps) times Volts (110 ) = 538 Watts. There are ~ 746 Watts in 1 horsepower. Visually, the motor looks robust enough , certainly more than a 1/2 horsepower. I watched this for a while and bought it during another 11% rebate sale. I was trying to wait for a sale, but the price actually bumped up from $200 to $220, and now it looks like it’s up to $230. Now that I have it, they seem to go on sale occasionally for $180-200. 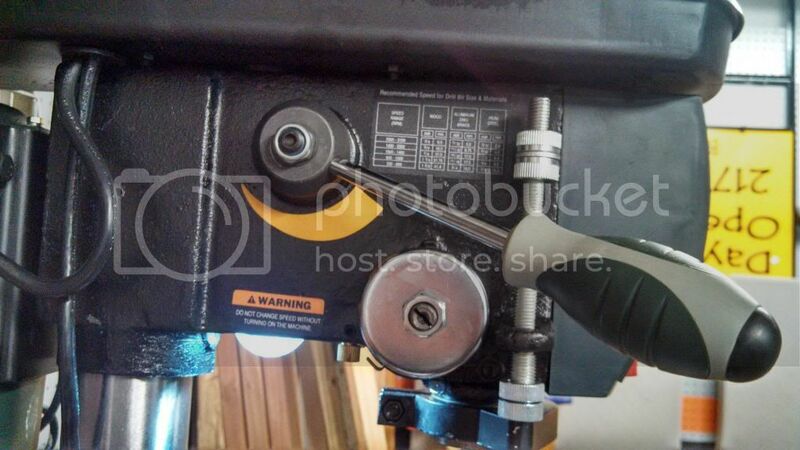 It’s a nice drill press for the money, and I have no complaints. Mine sits on a dedicated stand that sits just a few inches lower than my bench, since this is almost a cross between a bench and floor model. 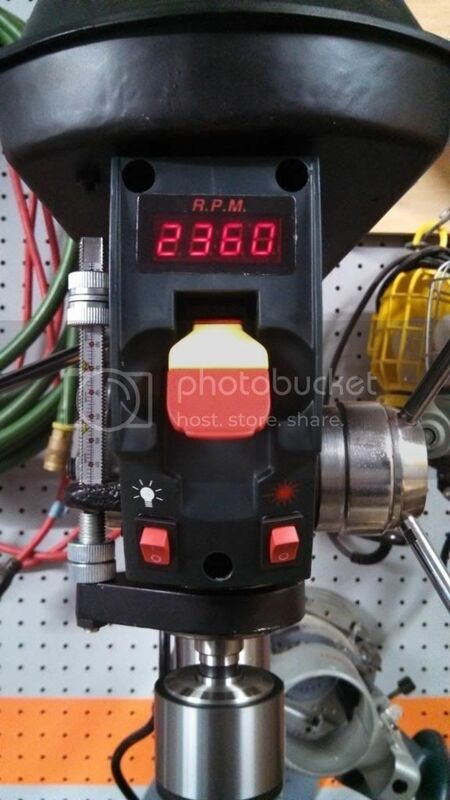 The variable speed couldn’t be any easier and the digital readout makes it even better. Definitely build a table and eighty-six that fence it comes with. 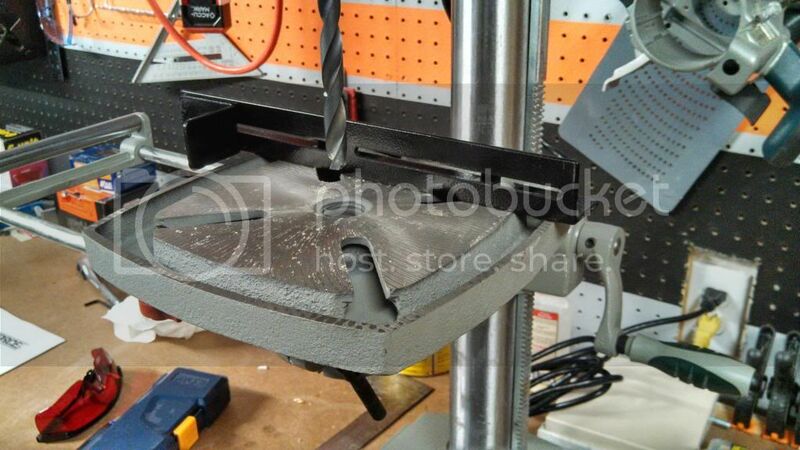 The table is too much of a metalworking table and collects sawdust in the grooves. @Mainiac Matt – the variable speed function is based on a Reeves pulley (variable diameter) system. Similar to how some lathes adjust. 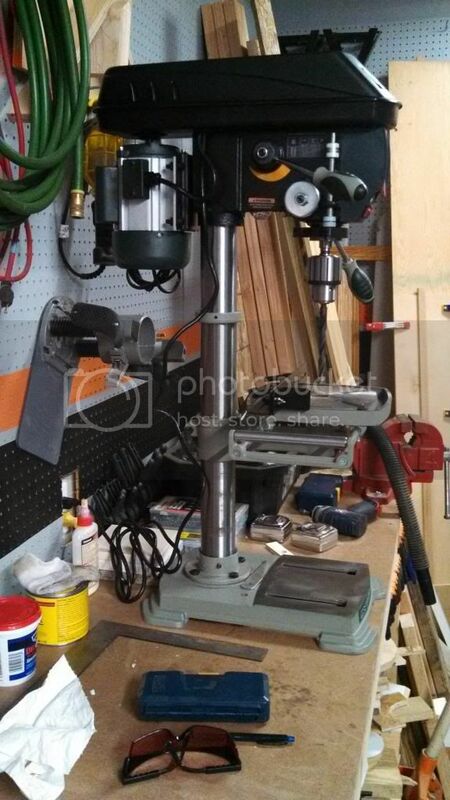 I think I mentioned this when TheDane posted his review a while back, but this drill press is basically identical to one of Jet’s smaller drill presses (the JDP-12, if I remember right). Just a different paint job. One interesting note – I looked at the specs for the bearings used on this drill, and they actually look pretty good and are actually rated for radial loads like a milling machine, so you might be able to slap an XY table on it for lightweight metal/wood milling tasks. I would buy this also if I needed one! This is what brand name tools do when they can’t see their overly priced brand name tools. Just the reason I buy Black and Decker cordless tools, they are Dewalts consumer tools. I have literally bought a B and D and a Dewalt of the same style and put the guts from the Dewalt into the B and D shell just to prove it. GREAT BUY! 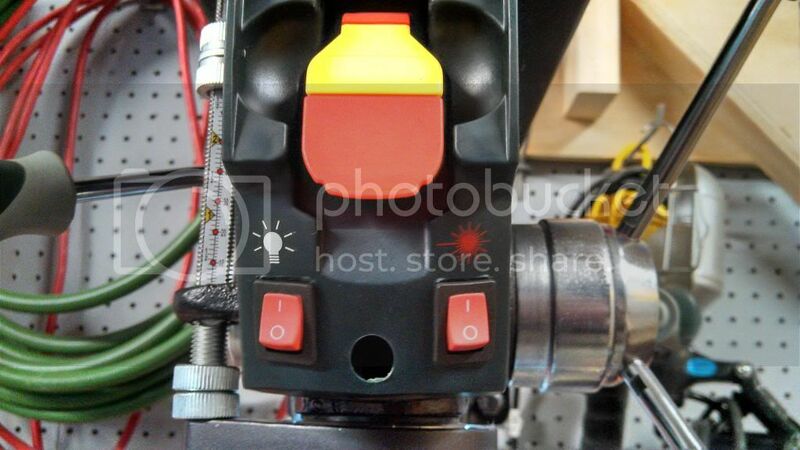 Further checking indicates the motor is 2/3 H.P..